With a Group profit of 645 million francs, Swiss Post achieved a solid annual result in 2015. Trends in the four markets varied, but all contributed to the good result. Swiss Post intends to maintain high quality levels, improve its efficiency and adapt its capacities to demand. That's why it made substantial investments in 2015. Customers continue to be very satisfied with Swiss Post. Digitization is permeating the daily lives of many people, changing their consumption patterns, lifestyles and working habits. The dynamics of change involved in this process are considerable. Swiss Post understands that today's world is interconnected, and builds bridges between the physical and digital worlds. With its expertise in communication, logistics, passenger transport and financial services, it increasingly develops integrated solutions and continues to offer individual products and services in modular form. It intends to win over customers by offering them products that are both easy to access and easy to use, giving them greater scope to succeed. This will enable Swiss Post to develop and maintain a high-quality universal service, while at the same time meeting its owner's goals. 2 As at 31 December 2015. Swiss Post recorded a Group profit of 645 million francs in 2015 (previous year: 638 million francs). Operating profit (EBIT) stood at 823 million francs (previous year: 803 million francs). The slight increase is mainly due to changes in the carrying amounts in the financial services market. The economic environment and the ongoing low interest situation remain challenging. Trends in the four markets varied, with operating income in three of the four markets stagnant or declining. 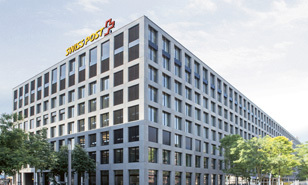 Swiss Post is investing in the future: procuring new scanners for delivery staff, expanding capacities at the parcel centers, relocating to its new headquarters and making space available to third parties at PostParc. In addition, PostFinance is modernizing its core banking system. In 2015, the Swiss public was again satisfied with Swiss Post's postal services and their personal contact with Swiss Post employees. Over 22,000 private and business customers are surveyed each year by an independent research institute. As in the previous year, Group-wide customer satisfaction received a good 80 out of 100 index points. Particularly outstanding is the rating by recipients of delivery quality. This is determined in a separate survey of 12,800 recipients and, at 91 points, also maintains the very high level of the previous year. This is the ninth time in a row that the score achieved is higher than 90 points. In the categories used by the researchers, values above 80 are considered to reflect “very satisfied” customers. Last year, Swiss Post processed around 2.2 billion addressed letters. 97.8 percent of all A Mail letters were delivered on time, while 98.9 percent of all B Mail letters arrived on schedule. In 2015, Swiss Post transported more parcels than ever before: around 115.2 million. Nevertheless, the quality of previous years remains constant: in 2015, 97.5 per cent of all PostPac PRIORITY and all PostPac ECONOMY parcels arrived on time. francs in normalized Group profit, up slightly year-on-year. show that customer satisfaction remains at a high level. addressed letters were posted in Switzerland in 2015.
francs represents the level of average customer assets held by PostFinance. parcels were delivered in Switzerland in 2015.
passengers were transported by PostBus in 2015.